The Royal Challengers Bangalore (RCB) finally managed to win their first match of the season beating the Kings XI Punjab (KXIP) by eight wickets at Mohali on Saturday. 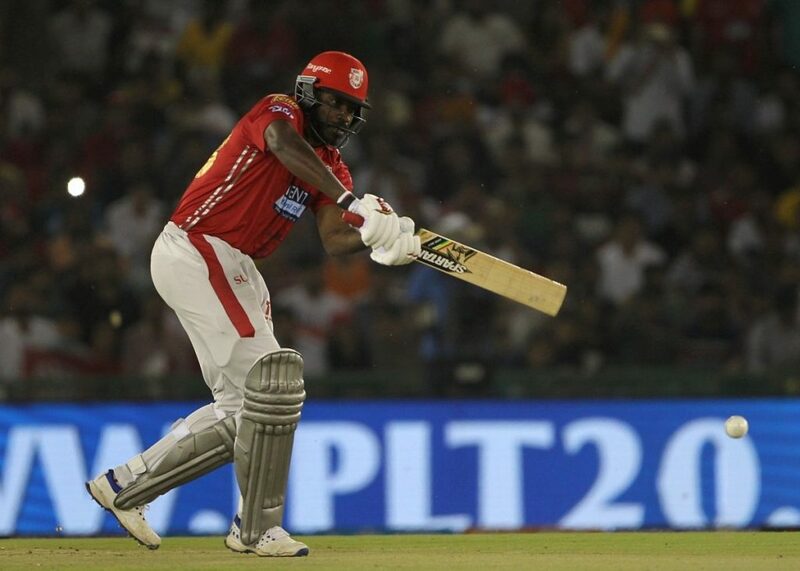 Batting first, KXIP posted a total of 173-4 in 20 overs courtesy of a scintillating knock of 99 not-out by ‘Universe Boss’ Chris Gayle. 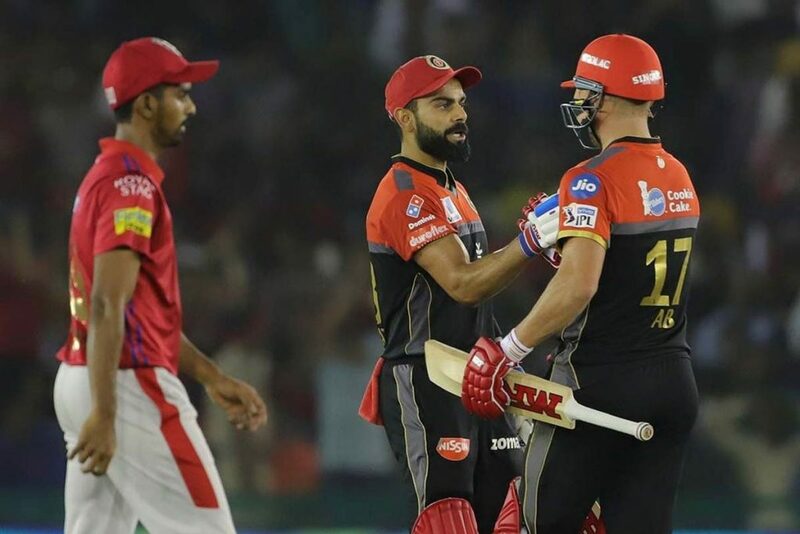 However, Virat Kohli and AB de Villiers’ half-centuries overshadowed Gayle’s knock as RCB went on to chase the 174-run target with four balls to spare. It was a not so clinical performance by the visitors as Gayle was dropped on 8 and later on 78 by none other than Virat Kohli and Ab De Villiers. The West Indian made them pay dearly for their mistakes, smashing an unbeaten 99 with five sixes and as many as 10 hits to the fence to single-handedly anchor the Punjab innings. The visiting side’s bowlers however deserve much credit for the way they bowled to him, not letting him unleash his strokes even during the death overs. The Universe Boss remained unbeaten on 99 runs but it was by no means a Chris Gayle like innings which we are to accustomed to seeing. The chase began on a spectacular note for the visitors with Parthiv Patel and Kohli smacked boundaries upfront in the powerplay. The left hander managed to add some quick runs before being dismissed by Ravi Ashwin but from then onwards, it was all about Virat Kohli and Ab De Villiers. The iconic duo added 85 runs together for the third wicket even as the two players went past the 50-run mark, not for the first time in the history of the IPL. Things slowed down considerably in the second half of the chase and the game became interesting with Kohli falling. Marcus Stoinis however came out and played with intent, taking the pressure off De Villiers, who killed the game with his signature shot for a six off Mohammad Shami in the penultimate over of the match. It was an attempted yorker from Shami, who missed his mark by just an inch and the ball ended up being a low full toss. 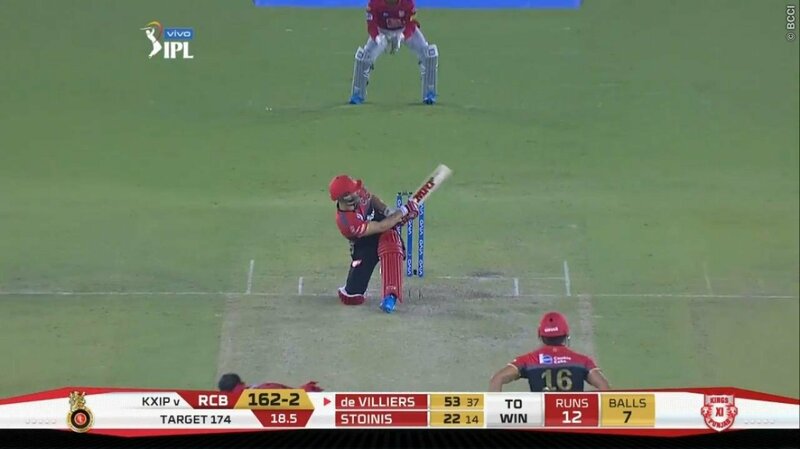 De Villiers, who was standing deep in his crease waiting for the yorker, moved across to the off stump, bent down on one knee before sweeping it over deep fine leg for a maximum. It was a signature hit from the South African which reduced the equation to just 6 runs off the last over before Stonis hit the remaining runs in the next two balls to finish the match for RCB.